Fruity and Refreshing Ice Pops!!! This weekend I used up some zucchini in a zucchini-date loaf and last night I used up some more in a delicious and simple zucchini flat bread to accompany some pasta for dinner. In a mixing bowl, stir together the ricotta cheese, garlic, lemon zest and parsley. Season with salt and pepper. Place the crust onto a baking sheet drizzled with olive oil. Spread the ricotta mixture onto the crust and top with the zucchini rounds and red onion. Drizzle the flatbread with some more olive oil and place in the oven. Bake until the crust is golden and crisp and the cheese is bubbly, about 15 minutes. The other night I took my new Zoku Ice Pop Maker for a spin using some delicious raspberries from my garden. I made six ice pops in two different flavours, both featuring the freshly picked berries; Raspberry-Lime and Raspberry-Kiwi! For the first flavour I prepared some homemade limeade. I combined 1/2 cup of water with 1/2 cup of sugar in a small saucepot to create a simple syrup. I placed the pot over medium-low heat and heated until the sugar was dissolved. I then combined the sugar mixture with 1/2 cup of fresh lime juice and 2 cups of ice cold water. Once I had my limeade prepared, I stuck some whole raspberries onto the wall of my ice pop maker, then proceeded to pour in my limeade and waited until they froze. For the second flavour, I pureed 1 cup of raspberries with 1 sliced kiwi and 1 cup of water and about one Tbsp. of sugar (the amount of sugar will depend on the sweetness of your fruit).I then passed the puree through a strainer and let it chill. I then lined my ice pop maker with some freshly sliced kiwis before pouring in the fruit puree. If you don't have one of these fantastic little gadgets, you can use traditional ice pop molds and wait for them to freeze overnight. Look how pretty they look! They were also delicious and perfect for a warm summer night! I apologize for the lack of posting. Lately things have been pretty crazy at work with a kid's cooking camp one week and then a teen cooking camp the next! Things have settled down and I will be back to regular posting. 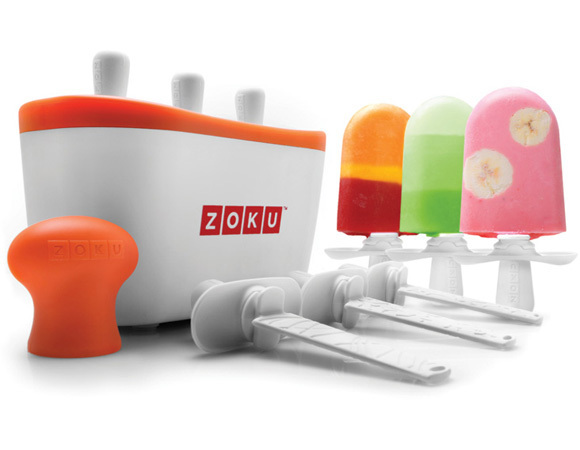 The Zoku Quick Pop Maker allows you to make ice pops in 7-9 minutes!!! I am so excited to try out exciting flavours and combinations and will be sure to post all my experiments. In the meantime check out their website here. In The GTA you can purchase your own Zoku Ice Pop maker at Nella Cucina. When I first started dating my now husband (Jordan) his tastes were pretty steak and potatoes, literally! Although over the past 6 years I have gotten him to expand his palate there are still some things I can't get him to budge on (like fancy cheese). The other night I decided to make steak sandwiches for dinner, the only problem is that when I think of steak sandwiches I think of fancy toppings like blue cheese, caramelized onion and arugula and Jordan thinks of steak and barbecue sauce. Tonight, to satisfy both of us I made two different sandwiches, a fancy steak sandwich and a not so fancy one. I topped my sandwich with a horseradish and blue cheese cream, caramelized onions and arugula and for Jordan I did a simple sandwich with barbecue sauce and sauteed onions and peppers. I simply grilled the steak up on the barbecue then let it rest before thinly slicing it and placing it on some nice bread and topping with our desired toppings. Heat a medium saucepan over medium-high heat. Add oil then add the onion and garlic and cook until the onion is translucent. Stir in the tomato paste and cook for 1 minute then stir in the diced tomatoes, brown sugar, Worcestershire sauce and white vinegar. Bring to a boil, then lower the heat, cover and let simmer for 30 minutes. Using a hand blender puree until smooth. Season with salt and pepper. Once cool, store in an airtight container in the refrigerator for up to a week. Heat a large saute pan over high heat, once hot add the oil and swirl to coat the pan then add the onions. Cook the onions over high heat and cook until starting to brown, stirring occasionally. It will look like they are going to burn, this is okay. This is the sugar releasing from the onions, you need this for proper caramelizing. This will take about 5 minutes. Once the onions are browned, lower the heat to medium low and continue to cook for 30 minutes, stirring occasionally. The onions are done when they are wilted, golden brown and syrupy. Place all the ingredients in the bowl of a food processor and blend until smooth. Can be stored in an airtight container in the refrigerator for up to two weeks.